The homeostasis model assessment (HOMA) is an indirect, rapid, accurate, and cost-effective method of assessing insulin resistance based on patient's fasting plasma insulin and glucose concentrations. Several studies have reported a significant correlation between HOMA and the traditional hyperinsulinemic-euglycemic clamp method.,, Owing to its robustness, HOMA is the most commonly used measure of insulin resistance in epidemiological studies. The current study primarily aims at defining the association between insulin resistance and zinc deficiency among both PCOS and selected control patients. It also looks at certain risk factors associated with obesity among the study population in Duhok City, Kurdistan Region, Iraq. The current case–control study was performed at Azadi Teaching Hospital/Gynecological Outpatient Clinic in Duhok City/Kurdistan Region/Iraq. The study included 80 women (40 cases with PCOS and 40 controls of healthy women who accompanied the PCOS cases). The recruitment period extended from August 2017 to March 2018. Inclusion criteria for the current study were as follows: patients with a diagnosis of PCOS according to the Rotterdam criteria requiring at least two out of the three following characteristics: (i) cycle disorder, (ii) clinical or biological hyperandrogenism, and (iii) antral follicular excess on ultrasound with ≥12 follicles from 2 to 9 mm per ovary and/or ovarian volume ≥10 ml. This study was approved by the Kurdistan Board for Medical Specialties/Directorate of Training Affairs/Scientific Research Units. A written informed consent was obtained from each participant. Two independent samples t-test was used to calculate the P values of the difference in mean of age, serum zinc, body mass index (BMI), and HOMA scores between cases and controls. Fisher's exact test was used to calculate the P value of the association between marital and PCOS statuses, as well as the P value of the association between marital status and BMI. Multiple binary logistic regression analysis was used to calculate the adjusted odds ratios (ORs), 95% confidence intervals (CIs) and P values for the association of selected covariates (age, PCOS status, and serum zinc) with the outcome variable of “HOMA score.” PCOS status was used as a categorical variable while both age and serum zinc were used as continuous ones. Likewise, multiple binary logistic regression analysis was used to calculate the adjusted ORs, 95% CIs and P values for the association of age, PCOS status, and marital status with the outcome variable of “BMI.” The latter was categorized to “<25” and “25 and more.” The age was used as a continuous variable in the model. Hosmer–Lemeshow test was used to check for goodness-of-fit of the regression models. All statistical analyses were performed using Statistical Package for the Social Sciences version 18 for Windows/MAC. (SPSS, IBM Company, Chicago, USA). All tests were two-sided with 0.05 level of significance. A total of 80 participants were incorporated in the current study, of whom 40 participants had PCOS diagnosis and 40 participants served as controls. There was no age difference between both groups (Mean = 26.77 years, standard deviation [SD] = 6.42 years for PCOS cases versus mean and SD of 27.57 years and 6.45 years, respectively; P = 0.48). Likewise, there was no difference in the serum zinc levels between cases and controls. 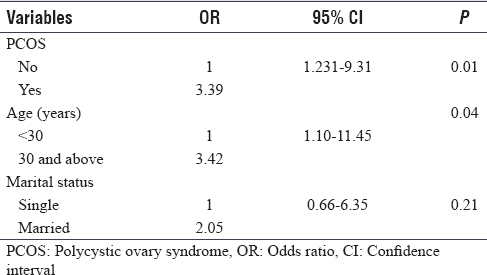 However, patients with PCOS had significantly higher BMIs and HOMA scores compared to the controls (P = 0.005 and 0.007, respectively) [Table 1]. 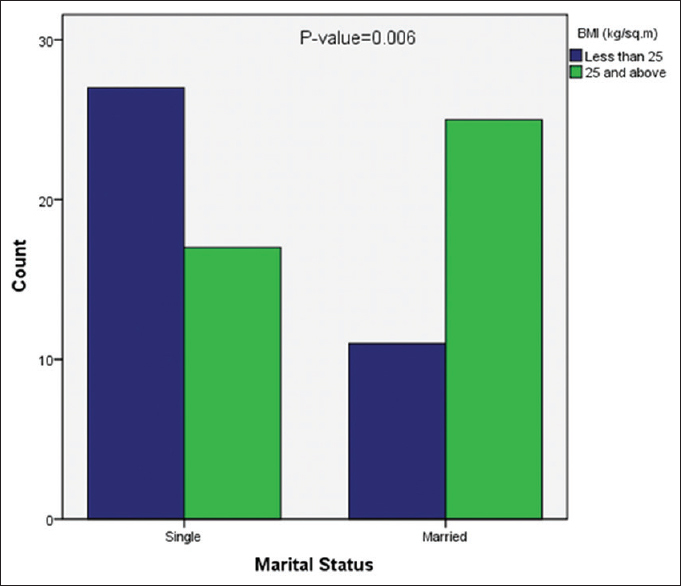 [Figure 1] shows that there is no difference between cases and controls in terms of the marital status (P = 0.81). When adjusted for age and PCOS status, patient with higher serum zinc levels had significantly lower HOMA scores (OR = 0.93, 95% CI = 0.91–0. 0.97, P = 0.01). On the other hand, patients with PCOS had significantly higher HOMA scores compared to controls of similar age and serum zinc levels (OR = 3.9, 95% CI = 1.21–12.66, P = 0.02). Likewise, higher HOMA scores were observed with older ages even after controlling for PCOS status and serum zinc levels (OR = 1.10, 95% CI = 1.05–1.18, P = 0.03) [Table 2]. [Figure 2] shows that married participants had a significantly higher BMI (P = 0.006). 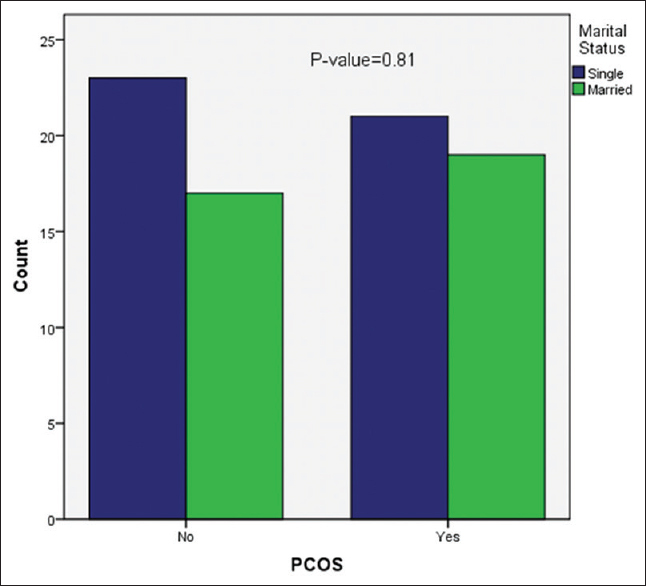 However, this association is confounded by age and PCOS status as shown in [Table 3]. On the other hand, older ages and patients with PCOS had significantly higher BMIs in the multivariate analysis (P = 0.04 and 0.01, respectively). Studies have shown that marriage is linked to lower body weights, whereas divorced and widowed people have heavier body weights.,,, However, the association between body weight and marital status is subject to considerable cultural variations. Although married people were shown to weigh more in the univariate analysis of our study participants, such an association did not exist when we adjusted for age and PCOS status in the multivariate analysis. This indicates the marital status was a confounder, rather than a risk factor for obesity, in our study. Our study has certain limitations, including the small sample size and relatively small number of variables taken into consideration. However, it does provide an insight about the association of serum zinc with HOMA in PCOS patient, and perhaps in the general population. Besides, it is the first study that deals with such an analysis in the Kurdistan Region of Iraq. However, larger studies need to be done to evaluate the effect of such an association at a larger population scale. Interventional studies with zinc supplementation for patients with insulin resistance can be considered. From results of this study, we can conclude that higher serum zinc levels are independently associated with lower HOMA. Patients with PCOS had significantly higher insulin resistance when compared to the controls of similar age and zinc level. Mu L, Zhao Y, Lai Y, Li R, Qiao J. Insulin resistance and B-cell dysfunction and the relationship with cardio-metabolic disorders among women with polycystic ovary syndrome. Clin Endocrinol (Oxf) 2018;6:1-10. Bozdag G, Mumusoglu S, Zengin D, Karabulut E, Yildiz BO. The prevalence and phenotypic features of polycystic ovary syndrome: A systematic review and meta-analysis. Hum Reprod 2016;31:2841-55. Knochenhauer ES, Key TJ, Kahsar-Miller M, Waggoner W, Boots LR, Azziz R. Prevalence of the polycystic ovary syndrome in unselected black and white women of the Southeastern United States: A prospective study. J Clin Endocrinol Metab 1998;83:3078-82. Randeva HS, Tan BK, Weickert MO, Lois K, Nestler JE, Sattar N, et al. Cardiometabolic aspects of the polycystic ovary syndrome. Endocr Rev 2012;33:812-41. Torchen LC. Cardiometabolic risk in PCOS: More than a reproductive disorder. Curr Diab Rep 2017;17:137. Emoto M, Nishizawa Y, Maekawa K, Hiura Y, Kanda H, Kawagishi T, et al. Homeostasis model assessment as a clinical index of insulin resistance in type 2 diabetic patients treated with sulfonylureas. Diabetes Care 1999;22:818-22. Katsuki A, Sumida Y, Gabazza EC, Murashima S, Furuta M, Araki-Sasaki R, et al. Homeostasis model assessment is a reliable indicator of insulin resistance during follow-up of patients with type 2 diabetes. Diabetes Care 2001;24:362-5. Tang Q, Li X, Song P, Xu L. Optimal cut-off values for the homeostasis model assessment of insulin resistance (HOMA-IR) and pre-diabetes screening: Developments in research and prospects for the future. Drug Discov Ther 2015;9:380-5. El Dib R, Gameiro OL, Ogata MS, Módolo NS, Braz LG, Jorge EC, et al. Zinc supplementation for the prevention of type 2 diabetes mellitus in adults with insulin resistance. Cochrane Database of Systematic Reviews 2015;(5):25-31. Himoto T, Nomura T, Tani J, Miyoshi H, Morishita A, Yoneyama H, et al. Exacerbation of insulin resistance and hepatic steatosis deriving from zinc deficiency in patients with HCV-related chronic liver disease. Biol Trace Elem Res 2015;163:81-8. Sadri H, Larki NN, Kolahian S. Hypoglycemic and hypolipidemic effects of leucine, zinc, and chromium, alone and in combination, in rats with type 2 diabetes. Biol Trace Elem Res 2017;180:246-54. Vallee BL, Falchuk KH. The biochemical basis of zinc physiology. Physiol Rev 1993;73:79-118. Haase H, Maret W. Fluctuations of cellular, available zinc modulate insulin signaling via inhibition of protein tyrosine phosphatases. J Trace Elem Med Biol 2005;19:37-42. Ezaki O. IIb group metal ions (Zn2+, Cd2+, Hg2+) stimulate glucose transport activity by post-insulin receptor kinase mechanism in rat adipocytes. J Biol Chem 1989;264:16118-22. Maxel T, Svendsen PF, Smidt K, Lauridsen JK, Brock B, Pedersen SB, et al. Expression patterns and correlations with metabolic markers of zinc transporters ZIP14 and ZNT1 in obesity and polycystic ovary syndrome. Front Endocrinol (Lausanne) 2017;8:38. Jamilian M, Maktabi M, Asemi Z. A trial on the effects of magnesium-zinc-calcium-vitamin D co-supplementation on glycemic control and markers of cardio-metabolic risk in women with polycystic ovary syndrome. Arch Iran Med 2017;20:640-5. Al-Maroof RA, Al-Sharbatti SS. Serum zinc levels in diabetic patients and effect of zinc supplementation on glycemic control of type 2 diabetics. Saudi Med J 2006;27:344-50.
de Luis DA, Pacheco D, Izaola O, Terroba MC, Cuellar L, Martin T, et al. Zinc and copper serum levels of morbidly obese patients before and after biliopancreatic diversion: 4 years of follow-up. J Gastrointest Surg 2011;15:2178-81. Foroozanfard F, Jamilian M, Jafari Z, Khassaf A, Hosseini A, Khorammian H, et al. Effects of zinc supplementation on markers of insulin resistance and lipid profiles in women with polycystic ovary syndrome: A randomized, double-blind, placebo-controlled trial. Exp Clin Endocrinol Diabetes 2015;123:215-20. Rosenfield RL, Ehrmann DA. The pathogenesis of polycystic ovary syndrome (PCOS): The hypothesis of PCOS as functional ovarian hyperandrogenism revisited. Endocr Rev 2016;37:467-520. Yu BP, Chung HY. Adaptive mechanisms to oxidative stress during aging. Mech Ageing Dev 2006;127:436-43. Sepe A, Tchkonia T, Thomou T, Zamboni M, Kirkland JL. Aging and regional differences in fat cell progenitors – A mini-review. Gerontology 2011;57:66-75. Park MH, Kim DH, Lee EK, Kim ND, Im DS, Lee J, et al. Age-related inflammation and insulin resistance: A review of their intricate interdependency. Arch Pharm Res 2014;37:1507-14. Jeffery RW, Rick AM. Cross-sectional and longitudinal associations between body mass index and marriage-related factors. Obes Res 2002;10:809-15. Meltzer AA, Everhart JE. Self-reported substantial 1-year weight change among men and women in the United States. Obes Res 1995;3 Suppl 2:123s-34s. Sobal J, Rauschenbach BS, Frongillo EA Jr. Marital status, fatness and obesity. Soc Sci Med 1992;35:915-23. Teachman J. Body weight, marital status, and changes in marital status. J Fam Issues 2016;37:74-96.